Rockin' Teenage Combo - "6/4 Getaway"
Rockin' Teenage Combo is a jazz trio from the Pacific Northwest who play jamming jazz standards that score high on the GROOVE meter, but also like to add in a more eclectic and adventurous element that space fans who dig jazz will love. The band consists of Dara Quinn on piano, synth, and organ, Paul Kemmish on upright and electric basses, former drummer Oliver Klomp on tracks 1-4, and new drummer Dave Hill on tracks 5-9. "6/4 Getaway" is their third album and is made up of compositions and improvisations from a series of live performances. The first four tracks with Klomp on drums are the more standard jazz tunes, but the music has a delicious groove that's not easily dismissed. Klomps steady drumming and Quinn's piano command attention with a simplistic intensity that had my eyes closed and head bopping. Drums and keys are equally prominent with Quinn leading the way and Klomp's percussion doing far more than filling a rhythmic role. One of the standouts is "BH", an adventurous, but playful tune that has a classical feel, but is still firmly based in jazz. The bulk of the tune is introspective, but it launches into brief frantic runs making this something of a quirky roller coaster ride. And Quinn loves those smokey lounge cooool jazz chords. So I'm grooving along and enjoying the disc, and then "Slinkshot" comes on and everything changes. The music gets freakier from here on. Much less jazz standard. A strong spacey synth presence plays a textural role as Quinn's keys perform in a less melodic, and more adventurous, style than on the previous tracks. It's got that tripped out funky feel heard on much of late 60's Miles Davis' electric music. "Gotcha" is a similarly exciting track that starts off as a drum solo, but sees Quinn go much further into freakout mode on her organ. My other favorite is "Nkelo", a great jam tune with a psychedelic edge. Kind of like the eccentricity of Can played against a conventional jazz background. I'm struggling for an analogy, but suffice it to say this is exploratory music that fans of InnerSPACE label-mates Mushroom will dig. "6/4 Getaway" is a great set of tunes and Quinn's keys are a potent force. Still, I'd love to hear this band with an expanded lineup of instrumentation. Even if just a guitar were added. The results could be lethal. 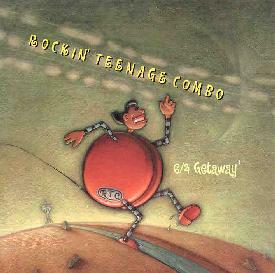 You can visit Rockin' Teenage Combo at their web site. You can visit InnerSPACE Records at their web site.